I've touched on it a bit, but I, unknowingly, hired a bad electrician regarding this old '35 house. Thankfully, he is gone and we now have a reputable company in there correcting everything and making sure all the wiring is good and safe, and up to current code. I think we all should have a good work ethic, but as it turns out, it seems hard to find people these days with one. Check out the 'replacing of old wire with new' job that the original "electrician" did below. Terrible work ethic. It's important, and if you think it's not, think again. I heard yesterday of someone who bought a house, and when they had the power turned on, by 2pm the whole house burned to the ground. Electrical is the first thing I think of. 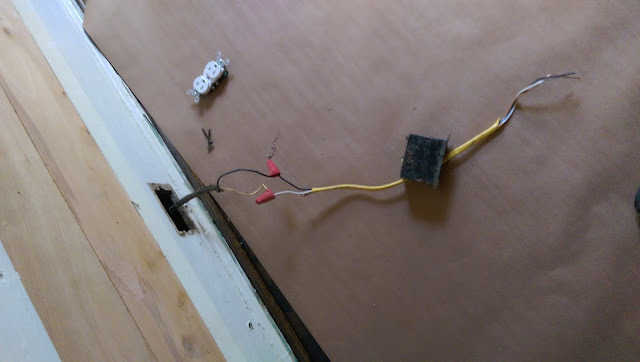 This is the 'new' wiring to a wall jack in the house. Again, it's all getting fixed with the new guys. Geez...you've got to be kidding!! That almost borders on criminal, in my humble opinion.